Lythgoe Family Panto began producing their American Panto series of shows in 2010. 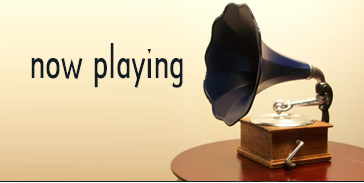 It is essentially musical theatre which encourages audience participation and features pop songs. 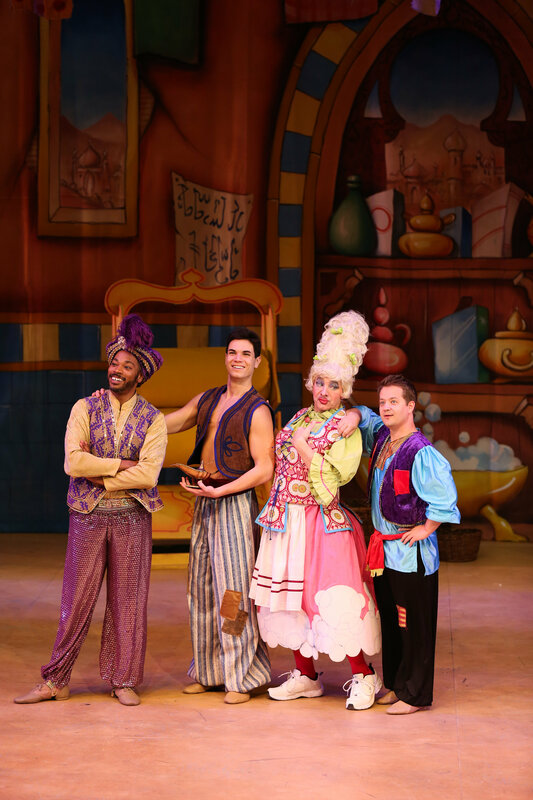 American Pantos® are based on fairytales kids know but a lot of the humor is directed at the adults with topical jokes and local references. I finally saw my first American Panto this past weekend at the Laguna Playhouse. 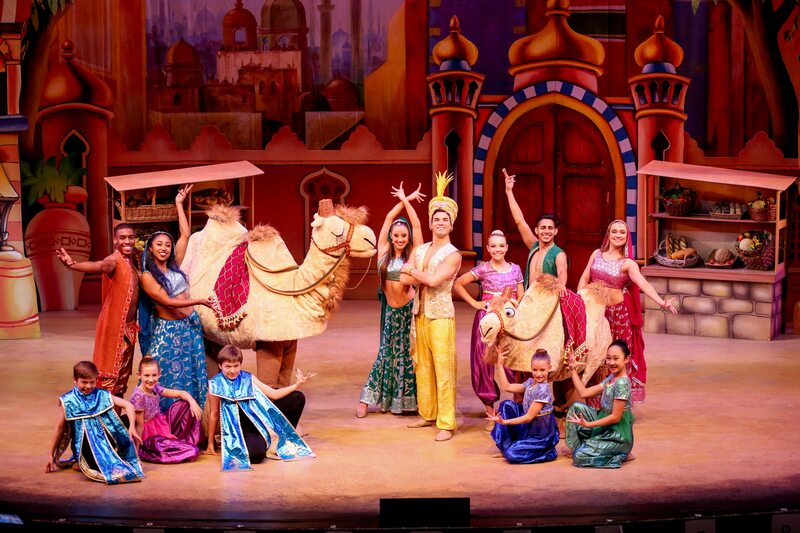 Aladdin and His Winter Wish is a fun, colorful, comic and musical delight for the entire family. There are enough silly shenanigans for the exuberant tiny tots in the audience to enjoy. There is also enough satire and humor that is over the heads of the kids in Kris Lythgoe’s script for the adults in the audience to enjoy. The plot is very basic–evil wizard cons young boy into entering a forbidden cave to get him a lamp which contains a powerful genie. The boy, a street beggar in love with the local princess, does it for the riches he is promised as payment. Boy gets lamp, genie gets out, boy gets riches and princess, villian is down, then up, then finally vanquished as all enjoy a happily ever after wedding in a desert snowfall. The fun is in getting there. Director Spencer Liff has created a nice pace for what is basically a series of sketches, moving the show along while also enabling his able troupe of farceurs time to display their shtick. Jason Gotay is a charming and energetic Aladdin with a very lovely singing voice he displays on some ballads and rock tunes. Kira Kosarin as The Princess is lovely but her singing voice is not that strong but she manages to pull off Carly Rae Jepsen’s “Call Me Maybe” with pizazz. Josh Adamson as Abanazar commands the stage as he encourages the audience to boo his every evil word and deed. 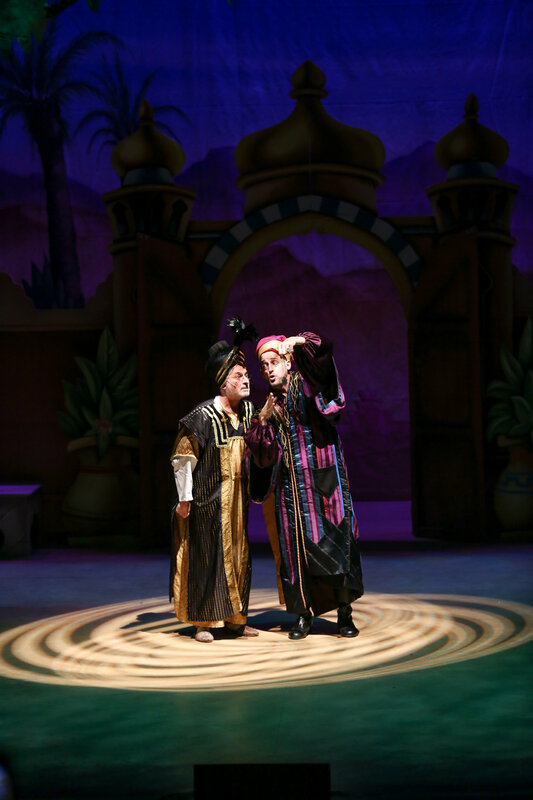 Barry Pearl adds fun support as the flustered and hypnotized father/Sultan. Jason Earles perfectly inhabits his character of Wishee Washee, the show’s cheerleader who encourages the kids in the audience to be kids. Jay Donnell is the high-spirited Genie. As in the classic British panto style, there is an outrageous drag character who gets to chew the scenery and spit out toothpicks. Here it is the indomitable Jason Graae as Widow Twankey, proprietor of the Bagroba Laundry and mother to Aladdin and Wishee Washee. Twankey’s costumes (designed by Albemarle Productions) alone elicited guffaws but Graae didn’t just wear them, he owned them. Liff also provided some lively choreography for his dancers (Armando Estrada, Quinton Peron, KT Madden and Kiana Wood) led by Alexis Gilbert who twirled constantly as the Slave of the Ring. Musical director Keith Harrison is at the keyboards providing The Widow with her rimshots and other musical cues. Ian Wilson designed the colorful and varied sets. 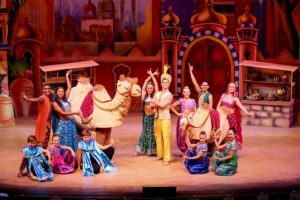 If you are tired of your family’s annual outing to see a Nutcracker or a Christmas Carol, give Aladdin and His Winter Wish a look. You will even be snowed upon in Laguna Beach. Laguna Playhouse, 606 Laguna Canyon Rd. in Laguna Beach. 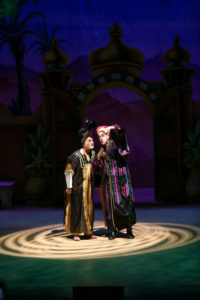 Ends Dec. 31. www.lagunaplayhouse.com.